Reagan didn’t just grow up a Chicago Cubs fan. He owes much of his success to the team. He became a Cubs radio broadcaster, was sent to California to cover the team, took a screen test while he was out there, and became a movie star, which led to his political career. As the president, he returned to Wrigley Field in 1988 to throw out the first pitch. Straight line…Cubs to Cubs. Dale Long had a pretty good career as a Cubs first baseman, but one game is probably remembered more than any other. On August 20, 1958, Cubs catcher Moe Thacker was in the hospital. The Cubs started that game with only two catchers on the roster; Cal Neeman and Sammy Taylor. Taylor was pinch hit for, and Neeman came in to take his place. But Neeman was ejected from the game…meaning the Cubs didn’t have a catcher in uniform to take his place. So, Cubs manager Bob Scheffing sent the ever-reliable Dale Long in to take over. When he entered the game he became the first left-handed catcher in baseball in more than 50 years. (The last before that was in 1906). He did it again a month later on September 11, 1958. There wasn’t another left-handed catcher until 1980 (Mike Squires with the White Sox in a similar emergency role). Benny DiStefano of the Pittsburgh Pirates also did it in 1989. That makes it a grand total of three men in more than one hundred years of Major League baseball; and Dale Long of the Chicago Cubs is the charter member of that exclusive club. 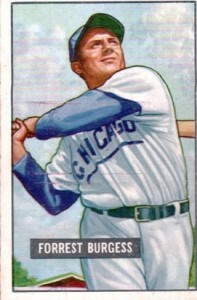 His nickname was “Shakes” and pitched for the Cubs at the end of the 1926 season. He pitched very well out of the bullpen, but after the season was over, he went back to the minor leagues and never returned to the big leagues.